On Tuesday the Hornets faced St Joseph. The varsity won 2611-2006. Kevin Hamilton (568) and Kevin Massa (567) led the team. The JV won 1946-1643. Zach Medlin (465) was the leading bowler. Senior night was held on Thursday against LT. Kevin Massa was honored for his commitment to the program. The varsity lost 2407-2724. Patrick Fatigato shot a 521 series with a 211 game. The JV lost 2172-2312. Zach Medlin again led the way with a 503 series. On Saturday the varsity finished 7th out of 11 teams at the ICCP Regional. Ricky Klepacz, Kevin Hamilton, and Kevin Massa led the team. On Monday the Hornets hosted Reavis. The varsity lost 2351-2532. Kevin Hamilton was the bowler over 500 with a 513 series and 205 game. The JV won 2274-2056. Jacob Kuczaty led the way with a 515 series. On Thursday Immaculate Conception came to town. The varsity won 2440-1704. Kevin Hamilton (565 series, 211 game), Kevin Massa (528 series, 212 game, and Patrick Fatigato (516) were the leading bowlers. The JV won by forfeit. Connor McGinley, Rishabh Arjun and Marko Josevski paced the team. 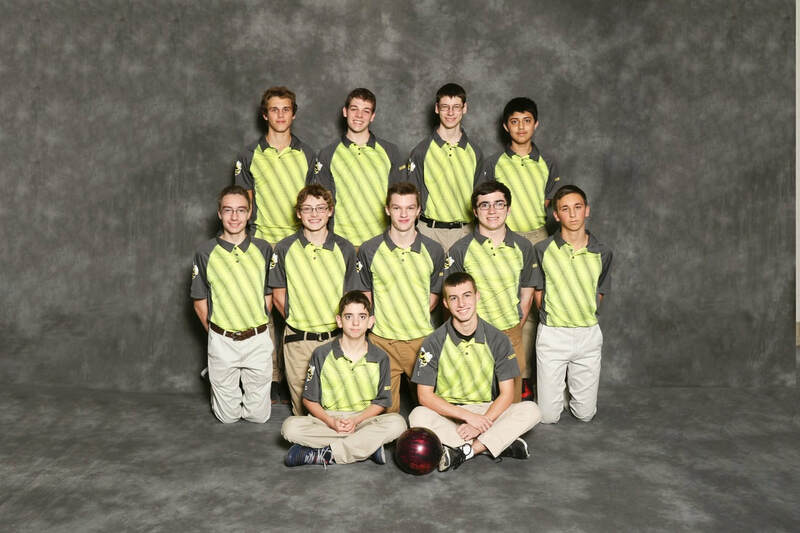 On Tuesday the team bowled Plainfield South. The varsity lost 2415-2811. Ben Smith led the team with a 547 series. The JV lost 2044-2726. Jacob Kuczaty was the leading bowler with a 431 series. Marko Josevski set a personal best with a 420 series. On Wednesday the Hornets took on Chicago Christian. The varsity lost 2472-2590. Kevin Massa had the high series (566) and game (236). The JV lost 1924-2026. Ezra Saywitz was the leading bowler with a 425 series. The Hornets traveled to Plainfield Central on Thursday. The varsity lost 2539-2974. Ben Smith had the high series (550) and game (220). The JV lost 1925-2621. Zach Medlin shot a 459 to led the way. On Saturday, the varsity competed in the Lincoln Way East Invite. The team finished in 6th place in the silver division. Ben Smith (1195 series) and Ricky Klepacz (1201 series, 255 game) led the team. On Tuesday the Hornets faced Hinsdale Central. The varsity won 2640-2567. Ricky Klepacz had the high game (222) and series (598). The JV lost 2030-2076. Ezra Saywitz had the high series (487), while Zach Medlin had the high game (208). On Thursday the team hosted Oak Lawn. The varsity won 2478-2352. Kevin Hamilton had the high game (208) and series (562). The JV won 2092-1949. Zach Medlin had the high game (209) and series (488). On Monday, November 21st the Hornets took on Plainfield North. The varsity lost 2338-3384. Kevin Hamilton (536) and Kevin Massa (524) led the Hornets. The JV lost 2017-2581. Zach Medlin (476) was the leading bowler for the Hornets. The team faced Bolingbrook. Varsity lost 2376-2920. Ezra Saywitz was the leading bowler with a 502 series. The JV lost 2155-2510. Jacob Kuczaty (480) and Patrick Fatigato (483) paced the team. The Hornets traveled to Suburbanite Bowl to take on Hinsdale Central. The varsity improved, but lost 2651-2865. Ricky Klepacz bowled well with a 618 series including games of 222 and 203. The JV lost 2199-2404. Patrick Fatigato recorded his 1st 600 series with a 601 including games of 213 and 214. The boys ventured to Parkside Lanes to face Oswego. The varsity lost 2548-2669. Kevin Hamilton (532), Ben Smith (525), and Patrick Fatigato (505) paced the team. The JV lost 1993-2541. Connor McGinley had a career high 226 game and 508 series. The varsity finished 16th at the 28 team Plainfield North Invite. Kevin Hamilton finished 47th overall with a 936 5 game series which included games of 232 and 219. The JV finished 17th out of 23 teams and the Lake Park Invite. Ben Smith finished in the top 15 with a great series that included 3 games over 200. ​​On Monday, November 7th the team faced Andrew in a two - game series. The varsity lost 1687-1817. Ezra Saywitz shot a 373 to lead the way. The JV lost 1367-1674. Jacob Kuczaty shot a 320 to pace the team. Tuesday, November 8th the team traveled to Minooka. The varsity lost 2769-3396. Ezra Saywitz again led the team with a 598 (240 game), and Ricky Klepacz shot a 589. The JV lost 1921-3258. Patrick Fatigato was the leading bowler with a 486. Both levels earned their first win of the season on Thursday, November 10 at home against Fenton. The varsity won 2311-2035. Ben Smith shot a 552 to lead the way. The JV won 2088-2027. Patrick Fatigato (515) and Kevin Hamilton (510) paced the team. On Saturday, November 12th the varsity competed in the 34-team Lake Park Invitational. The team finished 27th overall. Ricky Klepacz (1120) and Kevin Massa (1102) led the team.